Occupy Missoula Enters Its Third Day! In solidarity with Occupy Wall Street, Missoula’s 99% has set up an encampment at the courthouse on Broadway Ave. to protest against growing inequality, the corporate control of public resources, and the fundamentally unjust nature of capitalism itself. Northern Rockies Rising Tide endorses with enthusiasm Occupy Wall Street and Occupy Missoula, and encourages anyone outraged by this country’s twisted economic system to join us. General Assemblies are held every day at 5:30 and are open to all. Please come and participate in this amazing experiment in direct democracy, where we, as a community, come together and make a collective effort to find our own solutions to the problems we face. If you’re sick and tired of this country’s failed political process–the charade of two-party politics, the corporate control of the ostensibly public decision-making process–then join us in developing community-based solutions and asserting our collective voice! YOU ARE THE 99 PERCENT! On a less-inspiring note, Judge Dayton has modified his earlier decision and will now allow the permiting of Megaloads on Hyw. 12. See the Missoulian article for more details. NRRT remains committed to fighting the corporations that would turn our scenic byways into industrial shipping corridors for Tar Sands infrastructure projects, and hope that with the resurgence of an (anti-authoritrarian) populism in this country, we will begin to see an end to extreme energy projects like the Tar Sands. To put it bluntly: Corporations are destroying the planet, and the fate of the environmental movement is inextricably linked to the fate of the growing movement to abolish corporate power and create grassroots alternatives to capitalism. That’s what a top State Department official wrote in an email to the top lobbyist for TransCanada, a top tar sands oil producer, upon hearing that he had garnered support for the Keystone KL pipeline from a US Senator. That shouldn’t be too surprising, since the lobbyist was one of Hilary Clinton’s campaign aides during her presidential run. The cozy relationship between corporate lobbyists and decisionmakers isn’t anything new, but it’s just as despicable as ever. And with the Keystone XL pipeline issue, corporate America’s fingerprints are turning up all over the place. That’s why over 1200 ordinary people from around the country took the extraordinarily courageous step of sitting-in and getting arrested at the White House in late August — to show President Obama and leaders on Capitol Hill that real people can be just as powerful as corporate interests. Will President Obama, who campaigned saying “I don’t take a dime of their [lobbyist] money, and when I am president, they won’t find a job in my White House,” be willing to push back against TransCanada, its Wall St. financiers, and the stranglehold these corporations have on our government, or will he be complicit in destroying our democracy, our land and our atmosphere? Later on this year, when President Obama makes a decision whether to go forward with the tar sands pipeline, we’ll know where he stands. But the Occupy Wall Street protesters aren’t going to wait that long. The amount of energy that the Occupy Wall Street movement has generated so far is incredible. Over the course of two weeks, their numbers have ballooned from a few hundred to thousands, and Occupy movements have started up in dozens of other cities around the country and the world. Why? Because Americans are sick and tired of top officials cozying up to lobbyists, of political cronyism and petty corruption at the highest levels of government. While from an outside perspective the Occupy Wall Street protests might seem disorganized, their message is clear: If Wall Street is occupying the State Department and the halls of Congress, its time for the people to occupy Wall Street. In the case of the Keystone pipeline, the paper trail shows that Big Oil and Wall Wt. certainly walk the halls of the State Department with impunity. 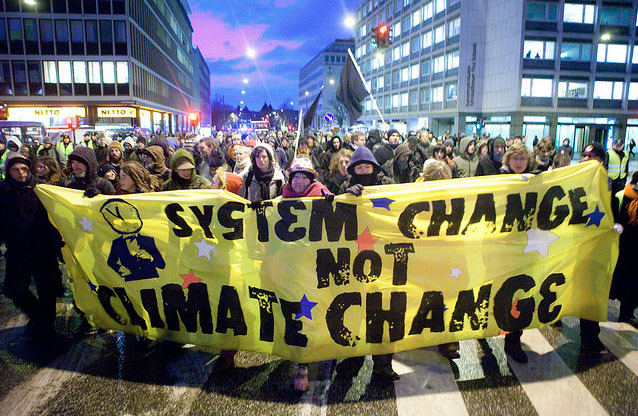 Now, it’s time for climate activists to join hands with the Wall Street protestors, and occupy together.